Some varieties of frozen pizzas from DiGiorno and California Pizza Kitchen are being recalled because the products may contain small plastic fragments. Nestle USA announced Friday it is recalling select production codes of four different frozen pizzas sold in the United States: California Pizza Kitchen (CPK) Crispy Thin Crust White, California Pizza Kitchen Limited Edition Grilled Chicken with Cabernet Sauce, DiGiorno Crispy Flatbread Pizza Tuscan Style Chicken, DiGiorno pizzeria! Bianca/White Pizza. 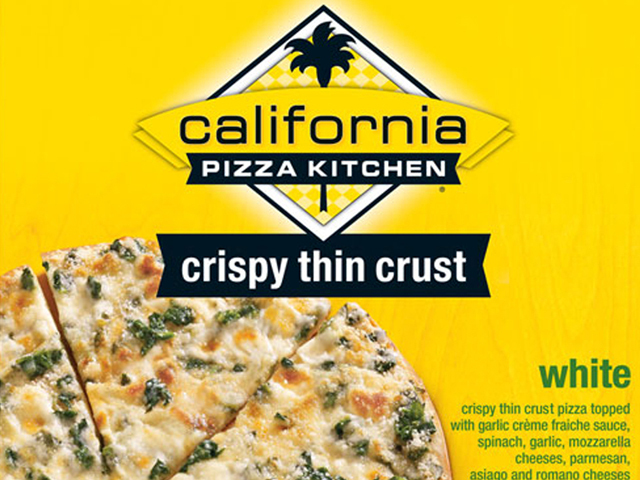 California Pizza Kitchen (CPK) Crispy Thin Crust White: UPC 71921 98745; production codes of 3062525951, 3062525952 and 3063525951. California Pizza Kitchen Limited Edition Grilled Chicken with Cabernet Sauce: UPC 71921 00781; production code of 3059525952. DiGiorno Crispy Flatbread Pizza Tuscan Style Chicken: UPC 71921 02663; production codes of 3057525922 and 3058525921. DiGiorno pizzeria! Bianca/White Pizza: UPC 71921 91484; production code of 3068525951. To locate the production codes for these pizzas, look for a blue or pink rectangular box on one of the side panels of the pizza box. Nestle USA said in a statement on the Food and Drug Administration's website that the recall was initiated after a small number of consumers complained that they found clear plastic fragments on their California Pizza Kitchen Thin Crust White pizzas. The company traced the fragments to a lot of spinach received from one of its suppliers. That prompted recalls of the other three pizza varieties that used this spinach, though no complaints were received for those varieties, Nestle said. All the pizzas were produced in February and March of 2013, so the company is asking consumers to check their freezers. Stores that cell the pizzas have been asked to remove the products. Consumers who purchased the pizzas should contact Nestle at 800-456-4394 or nestlepizza@casupport.com to receive a replacement. The company said it may also make arrangements to examine the pizza. "We apologize to our retail customers and consumers and sincerely regret any inconvenience created by this voluntary product recall," said Nestle.